IF YOU’RE ASKING YOURSELF, “WHY SHOULD I CHOOSE EGOPICKS?” WE HAVE FIVE GOOD REASONS FOR YOU! Personal service? Who offers that anymore? WE DO! EGOpicks is proud to provide the best personal service you’ll find anywhere on the internet. As she’s done since 2007, owner Lisa Lane will be the one to help you with your order from beginning to end. At EGOpicks, you won’t find any fancy DIY pick design generators or instant checkout systems. All along, it’s been our purposeful decision not to make the ordering process 100% automated. We truly enjoy assisting each and every customer personally with their orders – and making sure they are going to be fully pleased with their EGOpicks products. We value our new and returning customers, and we put huge effort into creating custom products that you will be proud to use and show off for years to come. Any questions you may have before, during or after your purchase will be happily answered in a timely manner. After nearly a decade, we are so proud to say that we have an extremely high ‘happy customer’ rate. We get ‘smile-inducing’ emails almost every day saying how much our customers like their custom picks and drumsticks, and that they came out even better than expected. We are ‘picky’ ourselves, so we simply refuse to send out anything that we are not extremely proud of. We actually accumulate hundreds of picks each year that just don’t meet our own high standards. We are happy to report though, that the misprinted picks do not go to waste … they are happily donated to a variety of amazing non-profit music programs like Guitars Not Guns. We will definitely do the same with our mis-printed drumsticks. We’re certain that there must be drumming programs out there that would be able to make great use of them. 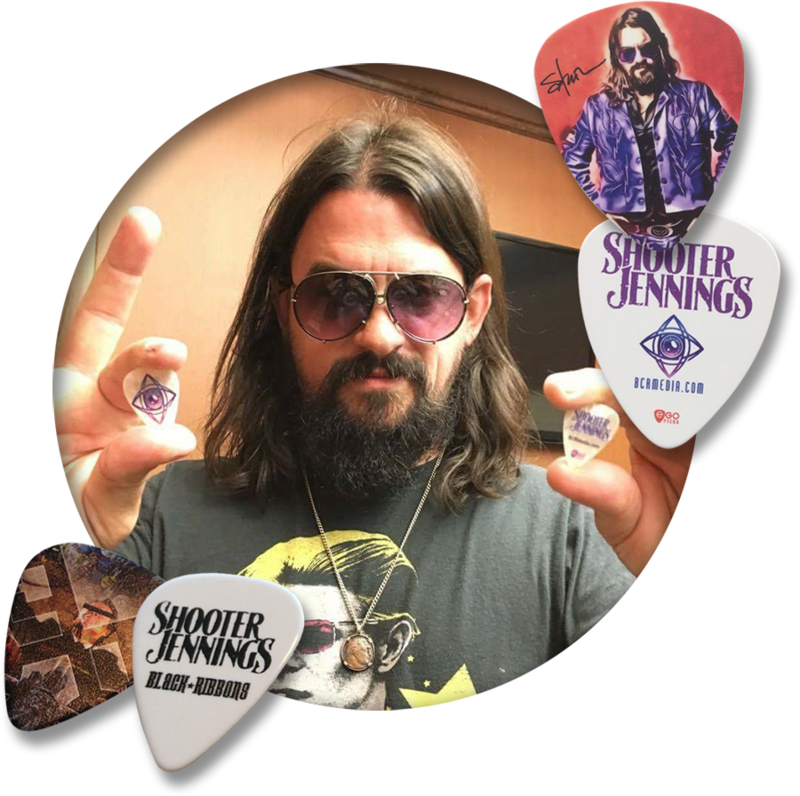 When you order from EGOpicks, you can be sure that you will be getting guitar picks made of premium materials … We actually use the very same picks that many of the iconic guitar manufacturers print their logos on, and sell in your favorite music stores all over the world. Our amazing White Hickory Drumsticks are of the highest quality, and they are made right here in Canada by the country’s #1 drumstick manufacturer. Our maple drumsticks are also excellent quality, and are priced right for both personal AND promo use. These sticks are great for your band merch tables. Our popular Accessories and Band Merch items were designed by us, and are exclusive to our EGOpicks customers. All items are made to order right here at EGOpicks. At EGOpicks, we make sure you can get some kind of variety within any order. We understand that many guitar players need different thicknesses of picks for different playing styles, and that many bands have more than one guitar player. With our OLD SCHOOL and NEW SCHOOL picks, we give you the option to mix and match your pick gauges. We can also accommodate more than one pick color as longs as the artwork and print color remain the same for all picks. With our custom White Hickory drumsticks, you’re more than welcome to mix and match your sizes/styles. 16 celluloid pick colors – more than anyone else! 7 Delrin pick colors. And guess what? Your preferred gauge does NOT determine which color you get! Our delrin picks come in 7 different colors, and all 7 colors are available in 7 different gauges. 16 Metallic foil colors that you won’t find anywhere else. This is just one reason why we’re the #1 choice for OLD-SCHOOL foil-printed custom picks. EGOpicks offers custom guitar picks in large and small quantities at competitive and affordable prices. With EGOpicks OLD SCHOOL picks you can order as few as 50 picks. With our NEW SCHOOL picks, we can accommodate orders as low as 10 picks! For custom drumsticks … if one pair is all you need, one pair is what we’ll make.